Removing the downpipe without removing the whole front of the car is tricky. There is very little space to reach and undo the bolts that secure the heat shields. But it is possible if you are careful. The photos below show how to do it! Why would you want to do it? To remove the precat! A stock downpipe with the precat removed will perform equally well as an aftermarket downpipe with a sports cat. The precat is what hurts performance and increases backpressure in the stock exhaust assembly. It is that tiny cylindrical cat, next to the main cat on the downpipe. 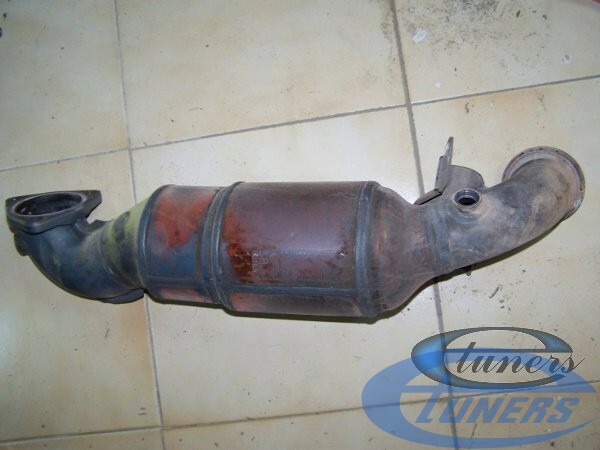 The main catalytic converter is more than enough to pass emissions testing and not create backpressure. I’m having the same trouble now trying to swap the downpipe of my 207 RC for a new one with race kat. I second that, I can only see one image and would Really appreciate the full detail on how this is done.